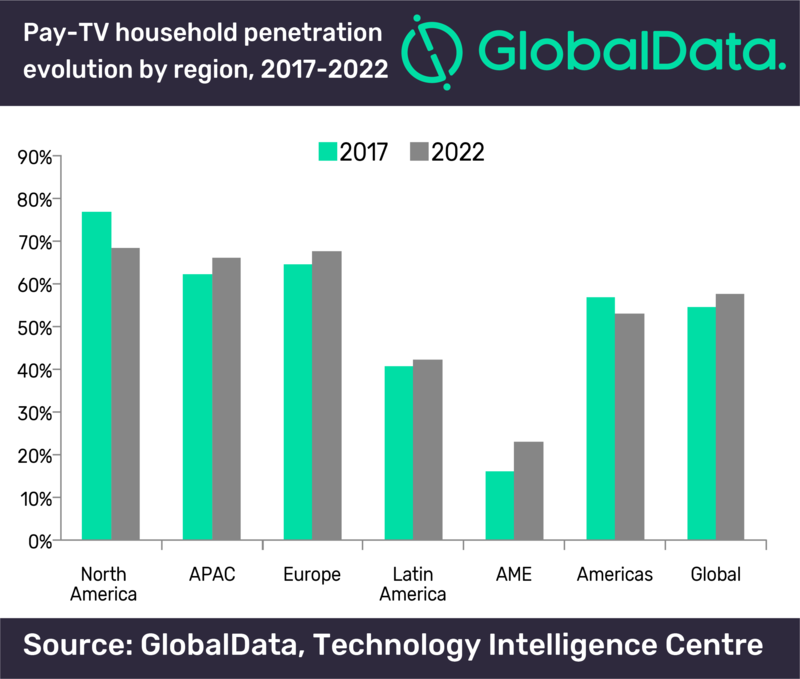 Africa and the Middle East (AME) pay-TV household penetration is expected to outpace all other major regions between 2017 and 2022, increasing from 16% in 2017 to 23.2% in 2022, according to GlobalData, a leading data and analytics company. According to GlobalData’s report: ‘Pay-TV Market Trends and Opportunities in Africa & the Middle East’ the AME’s pay-TV market is relatively underdeveloped but is growing rapidly and its pay-TV penetration in 2017 fell substantially below the global average of 54.4%. Jonathan Bachrach, Technology Analyst at GlobalData, comments: “The AME market consists of extreme heterogeneous pay-TV penetration levels. For instance, the UAE and Egypt have polar opposite pay-TV household penetration levels of around 88.4% and 2.5%, respectively. One of the biggest challenges facing pay-TV operators in AME is piracy, as the proliferation of illegal set-top boxes (STB) and decoders continue to negatively impact pay-TV operator’s revenues. Anti-piracy initiatives are vital to protect operator investments in premium broadcasting content and revenue streams. To counter the impact of piracy, pay-TV players can partner with government authorities to curtail the distribution of illegal content. Despite this challenge, the pay-TV segment in the AME region is still in its infancy and there is ample opportunity for growth.